BRIGHTON, Mich. - Recently one of the most iconic and historic performance vehicles roared out of the factory, ready to meet the mean streets of the Motor City. 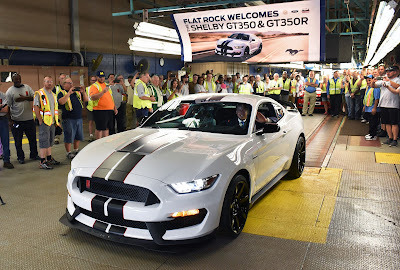 The all-new Shelby GT350R rolled off the line at the Flat Rock Assembly Plant to thunderous applause and wonder! The brand-new GT350 Mustang is Ford Motor Co.'s most athletic and well-know Mustang ever, and is designed to take on the world's most challenging roads and racetracks while creating an exhilarating experience for the driver. Bill Ford, Executive Chairman of Ford Motor Co. stated that this was indeed a very special day for the automaker. He also state that, "We have taken the GT350 formula to the next level of innovation, style and performance. Today, the legend continues." Born and raised on the track, the all-new Shelby GT350R rolled off the line at the Flat Rock Assembly Plant ready to take on any other vehicle in its way. If you would like more information on how to get your hands on Dearborn's own racing machine, stop by your Howell area used car and truck dealership! Brighton Ford is located at 8240 Grand River Ave. just north of I-96 in Brighton. We are a family owned and operated business that strives for customer satisfaction. For more information on Brighton Ford visit BrightonFord.com or give us a call at (800) 836-8206.